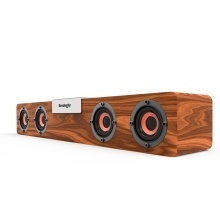 Adopting wooden material, SMALODY SL-90H wooden BT speaker is elegant and fashionable. It uses advanced BT 5.0 technology, effectively lower the energy consumption and provide stable transmission. With 4*5W louspeakers of 64mm large diameter, it can offer you with clear and loud sound, make you immerse in the music world. Also, its 2400mAh battery delivers 4-6 hours music playing time. A beautiful decoration and a powerful speaker in your house. Support one phone connect with two speakers at the same time, let you enjoy stereo sound performance with this TWS BT speakers. With advanced BT 5.0 technology, effectively lower the energy consumption and provide stable transmission, ensuring better performance. And it also supports TF card expansion and FM mode. Including 4*5W power louspeakers of 64mm large diameter, the wooden speaker offers you with clear and loud sound, make you immerse in the music world. Made of wooden material, elegant and fashionable, make it into a beautiful decoration in your room. With large 2400mAh capacity battery, the speaker can last for about 4-6 hours of music playing time. Large capacity, do not have to worry about power-off problem. Functions:Support Bluetooth 5.0 connection,TWS,TF card Slot,USB Slot,FM radio.